The Monogrip is simply the finest grip and best choice for your Taurus. The ergonomic shape and proportioned finger grooves position the hand consistently every time and are designed for optimum pointing characteristics. These features enhance accuracy by helping the shooter acquire a target faster and more consistently, shot after shot. Our exclusive molding process gives these grips a comfortable soft recoil absorbing feel that is non-slip. Hogue rubber grips hold securely in cold, wet or sweating hands. Monogrips are made by OverMolding our soft rubber over a hard inner skeleton or "insert". Because the rubber we use chemically bonds to the insert it provides an extremely durable grip that will not delaminate or come apart. The molded insert allows us to maintain exacting tolerances, assuring a proper fit and a grip that will function flawlessly. Monogrips are fully relieved for speedloaders and are securely attached to your gun in seconds using your stock screw. 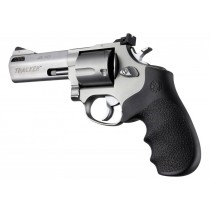 This grip fits Taurus Tracker models 415, 425, 450, 606, 445, 617, 627, 817, 970 and 971.